Dr. Régine Debrosse is currently a postdoctoral fellow at the School of Education & Social Policy, Northwestern University, Chicago. Taking a strength-based approach, she investigates how ethnic/racial identities & relationships can be leveraged to foster resilience. 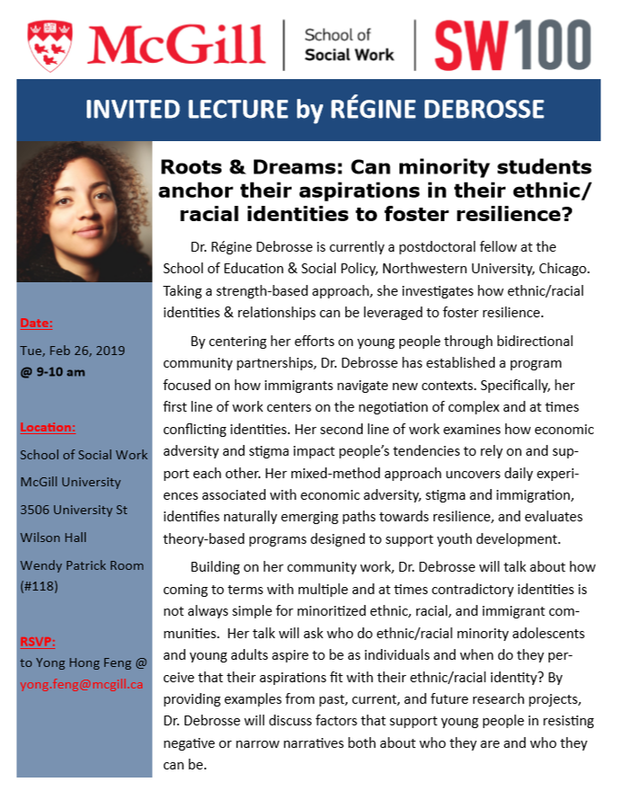 Building on her community work, Dr. Debrosse will talk about how coming to terms with multiple and at times contradictory identities is not always simple for minoritized ethnic, racial, and immigrant communities. Her talk will ask who do ethnic/racial minority adolescents and young adults aspire to be as individuals and when do they perceive that their aspirations fit with their ethnic/racial identity? By providing examples from past, current, and future research projects, Dr. Debrosse will discuss factors that support young people in resisting negative or narrow narratives both about who they are and who they can be.